The Community Speedwatch Group are volunteers who take part in monitoring vehicle speeds in the Dursley. Throughout July and August, community volunteers from the Speedwatch Group in conjunction with Dursley Neighbourhood Police team will be patrolling Uley Road and Woodmancote. These are two locations where the Town Council continue to receive correspondence from concerned road users about the speed of some vehicles. In June, the group recorded a vehicle travelling at a speed of 48 miles per hour within the 30mph limit on Uley Road. With the introduction of new rules and speeding penalties this could result in a driver being disqualified for a period of 7-28 days or having 4-6 points added to their license. A fine of 100% of their "relevant weekly income" is also a possibility should the matter go to court. Cllr Matt Nicholson, Chair of the Speedwatch Group, said "I'm pleased that our group has new volunteers and that we will be able to increase the number of patrols over the summer period. As well as being a visible reminder to motorists that speeding is not socially acceptable, when the group is accompanied by Special Constables then if necessary speeding tickets will be issued as a further deterrent." For more information on Community Speedwatch and for details of how you can become a volunteer please contact Cllr Nicholson or the Town Clerk by email: matt.nicholson@dursleytowncouncil.gov.uk or clerk@dursleytowncouncil.gov.uk or by telephone: 01453 547758. PCSO Griffiths, Mayor Neil Grecian and two of the winners. 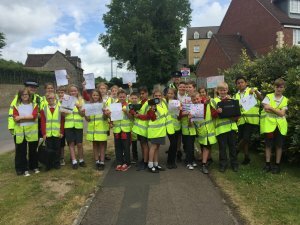 Year 5 and 6 pupils from Dursley C of E Primary Academy have taken part in a poster competition to raise awareness of speeding in the Highfields area. The competition was the idea of PCSO Josh Griffiths who is a regular visitor to the school and invited the Town Council to judge the entries. The Town Mayor, Cllr Neil Grecian, Chair of the Speedwatch Group, Cllr Matt Nicholson and the Town Clerk judged the competition and decided on three winning entries. The winners were Scarlet Crosbee (Yr 5), Lucy Rymer (Yr 6) and Alys Young (Yr 6) who were presented with a certificate from the Mayor on Wednesday 13th July. The Town Council have funded 30 signs, displaying the winning entries. They will be installed in Highfields for the start of the new term in September. The Town Council would like to thank PCSO Griffiths, the head, the pupils and class teachers for their co-operation in this competition. Dursley Primary Academy want motorist to slow down! Youngsters form Dursley Primary Academy teamed up with Dursley Neighbourhood Policing Team to conduct speed checks along the Uley Road. The children designed their own 'advisory speeding tickets' and these were issued to vehicles exceeding the speed limit. 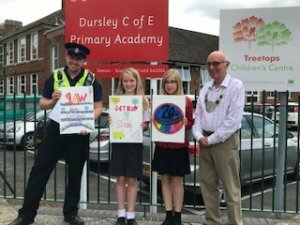 Out of 60 youngsters that took part in designing their 'advisory speeding ticket' 3 were selected and made into a sign that will placed around certain areas of Dursley.